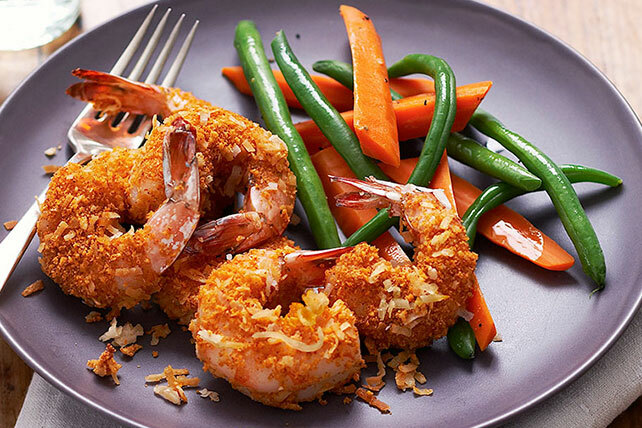 Try our SHAKE 'N BAKE Coconut Shrimp. This SHAKE 'N BAKE Coconut Shrimp is so sweet and crispy no one will believe it's a Healthy Living recipe! Combine first 4 ingredients in pie plate; set aside. Whisk egg and water in separate pie plate until blended. Prepare using SHAKE 'N BAKE Extra Crispy Seasoned Coating Mix. Prepare as directed, substituting boneless skinless chicken breasts, cut into 1/2-inch-wide strips, for the shrimp and increasing the baking time to 20 to 25 min. or until chicken is done.